Welcome to August. If you are a teacher, you are likely bombarded with schedules, class lists, piles of lamination to be cut, and lesson plans to write. Teachers are busy, busy, busy people in the month of August. 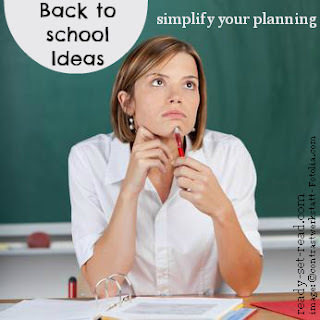 Besides making a cute classroom environment and getting everything organized for the first day, teachers must plan the entire school year. Planning your year can be overwhelming. It's helpful to have ready to go resources. I spent much of the last year finding great books for holidays and themes and organizing those books. Now I can check my calendar for upcoming holidays or themes that I want to cover with my preschooler, and locate the books at my local library or from my own collection. In fact, ready-set-read is a great place to do your weekly lesson planning. I thought I'd take a second to show you around the blog and help you find these great resources. I've rounded up our favorite books for US holidays including Halloween (or fall harvest), Thanksgiving, Christmas, Easter, Earth Day, Mother's Day, Father's Day, and Independence Day (Fourth of July). I've also included links to book activities for many of the activities. These are crafts or activities that you can do with your students after reading the book. Many of them would make nice displays in the hallway or classroom! Many teachers use thematic units in their lesson planning, especially in the early grades. You may be mapping out your resources right now for your themes. Adding books based around a theme is a great way to get kids to love books! It also helps children make connections between texts when they read a variety of texts on one theme. Making connections across texts is an important element of the common core state standards. I've included books lists for back to school ideas, shapes, colors, me and my family, under the sea, animals, gardens, outerspace, community helpers, transportation, dinosaurs, and friendship. If you'd like ready to go themes for preschool and kindergarten, I have several printable products. Some of them are even free. You'll find crafts, activities, games, literacy centers, early reader books, and journaling papers that are ready to print and use!